First a disclaimer: I have been in love with the idea of horses all my life. As a tiny child I remember my brother taking me to a movie where the theater was giving away a paint pony to one of the ticket holders. Among the crowd of probably a thousand people imagine my devastation when mine was not the winning number! When I was about ten years of age my family moved from Seattle to Kennewick, Washington and for a couple of years I got my wish and roamed the horse heaven hills on my own horse. That ended on our move back to Seattle and my only out let was a rental stable whenever I could save my pennies. Bottom line, you hear about parents who push their kids into the sport or interest dear to the heart of the parent – if by push you mean exposure and/or encouragement I plead guilty. Love, however, cannot be forced. For some it happens instantly, for others it has to grow. Enter Lia. 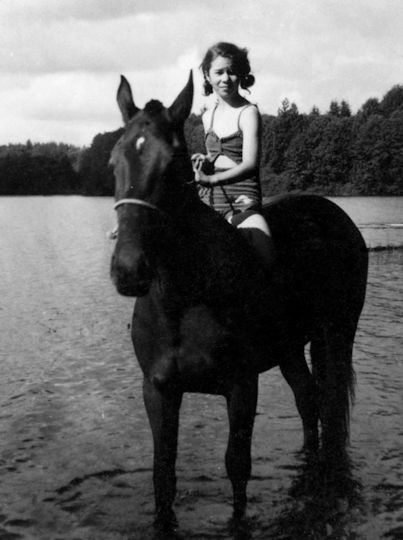 Her first moment in a saddle was hardly auspicious. Her father was deployed in Okinawa where we lived for a year. When she was going two we placed her on the back of a Water Buffalo, as I recall she was extremely unhappy at this torture! Our next experience with this very opinionated curly top was the Christmas following her second birthday. Home again and wanting a smash holiday, we splurged and bought our beloved baby a Mattel talking rocking horse. This paint pony was taller than our toddler and could go both up and down and forward and back. Lia came out of her room Christmas morning, took one look, and retreated back to her bedroom door. No amount of coaxing worked, until she said “Mommy, daddy ride”. So we did. That broke the ice and she grew to love her Blaze. Enter a real live horse. Before her father left us we were able to afford her enrollment in a Montessori school for her Kindergartner year. One day she informed me that they had a stable at the school and the next day her class would get to ride horses! There was no denying her excitement at the prospect – fast forward to the following night, “How did you like riding?” “I didn’t get to”. When I asked what happened there came a tale of being friends with the Stable Managers daughter who did not want to ride that day so….etc. Lia on her favorite Dude Ranch horse Pepper – clearly no longer worried about how tall the horse is! After what I like to think of as some adroit questioning, the truth came out. Horses are awfully big. Yes they are. You could fall off. Yes you could. Doesn’t it hurt? I honestly do not know or remember what in our discussion turned the tide, I tried to be truthful and upbeat. Whatever she took away from that conversation, the next opportunity she had to ride was a hit, and she came home ecstatic. Her father left shortly after that and we were alone and poor. I managed twice to save enough pennies for a visit to a dude ranch in the mountains. It was a splurge, admittedly, but we needed some light in those dark days, and a child needs some unadulterated fun. And fun we had, with Lia galloping across the meadows, golden braids flying. She was much bolder than her mother, who chose the easy paths down the hills rather than the cliff like short cuts! twelve I was fully employed and the proud owner of an automobile. This freed us to sign up with a trainer a few miles from town. 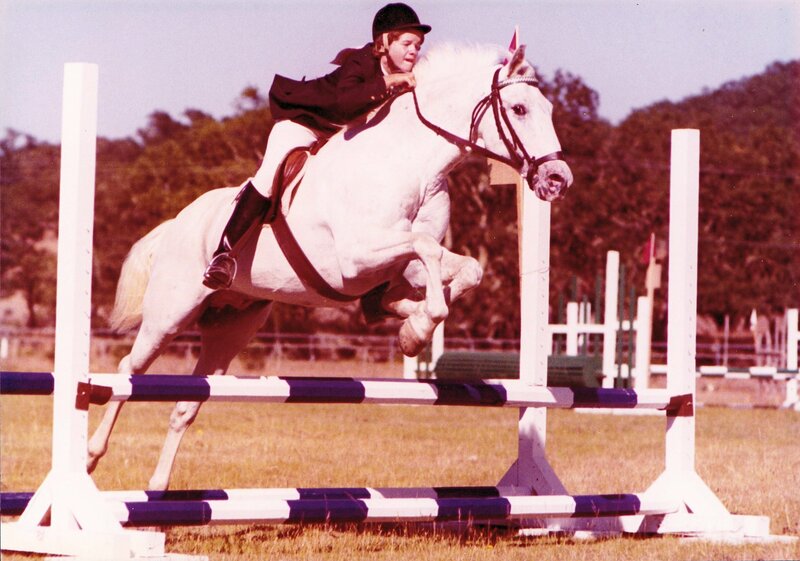 There is a story there, but suffice to say she was the conduit that led us to Wickiups Spotted Bear, Lia’s first “horse of her own”, who, by the age of twelve, had raced, been a stud, done eventing, and was the best teacher I could have found for my daughter. Price: $500. 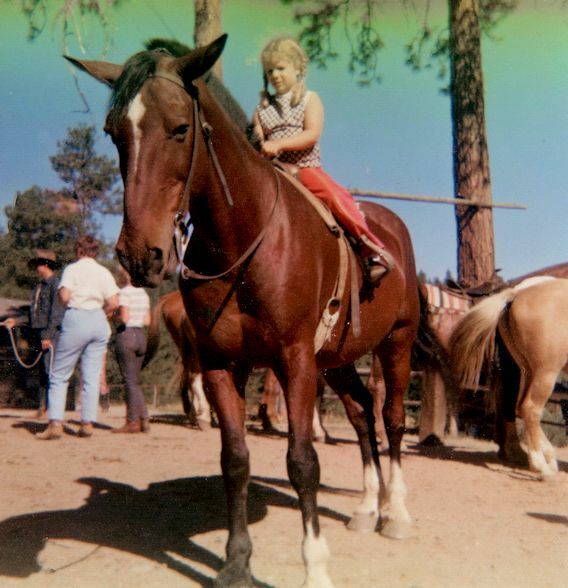 This entry was posted in My Journey and tagged Beginnings, birthday, dude ranch, first rides, guest author, horse crazy, pony dreams, Rhonda, Wicki. Bookmark the permalink.